Recently my friend Joël Franusic was stressing out about sending postcards to his Kickstarter backers and asked me to help him out. He pointed me to the excellent service Lob.com, which is a very developer-friendly API around printing and mailing. We quickly had some code up and running that could take a CSV export of Kickstarter campaign backers, verify addresses, and trigger the sending of customizable, actual physical postcards to the backers. We wanted to share the project such that it could help out other Kickstarter campaigns, so we put it on Github: https://github.com/mrooney/kickstarter-lob. Below I explain how to install and use this script to use Lob to send postcards to your Kickstarter backers. The section after that explains how the script works in detail. First, you’ll need to sign up for a free account at Lob.com, then grab your “Test API Key” from the “Account Details” section of your account page. At this point you can use your sandbox API key to test away free of charge and view images of any resulting postcards. Once you are happy with everything, you can plug in credit card details and start using your “Live” API key. Second, you’ll need an export from Kickstarter for the backers you wish to send postcards to. Now you’ll want to grab the kickstarter-lob code and get it set. A URL of an image or PDF to be used for the front of the postcard. This means that you need to have your PDF available online somewhere. I suggest using Amazon’s S3 service to host your PDF. A message to be printed on the back of the postcard (the address of the receiver will automatically show up here as well). warning: address verification failed for jsmith@example.com, cannot send to this backer. The script will verify all addresses, and importantly, only send to addresses not already sent to. The script queries Lob to keep track of who you’ve already sent a postcard to; this important feature allows you to download new Kickstarter exports as people fill in or update their addresses. After downloading a new export from Kickstarter, just run the script against the new export, and the script will only send postcards to the new addresses. Before anything actually happens, you’ll notice that you’re informed of how many addresses have not yet received postcards and prompted to send them or not, so you can feel assured it is sending only as many postcards as you expect. SUCCESS: All backers with verified addresses have been processed, you're done! 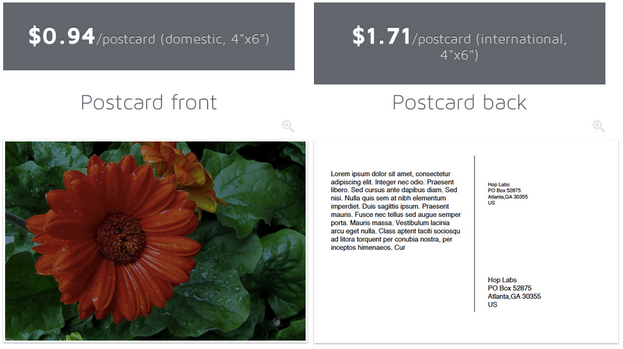 After previewing your sandbox postcards on Lob’s website, you can plug in your live API key in the config.json file and send real postcards at reasonable rates. This section explains how the script actually works. If all you wanted to do is send postcards to your Kickstarter backers, then you can stop reading now. Otherwise, read on! We start by importing four Python libraries: “csv”, “json”, “lob”, and “sys”. Of those four libraries, “lob” is the only one that isn’t part of Python’s standard library. The “lob” library is installed by using the “pip install -r requirements.txt” command I suggest using above. You can also install “lob-python” using pip or easy_install. “ParseKickstarterAddresses” is the code that reads in the backer report from Kickstarter and turns it into an array of Python dictionaries. The “addr_identifier” function takes an address and turns it into a unique identifier, allowing us to avoid sending duplicate postcards to backers. The “kickstarter_dict_to_lob_dict” function takes a Python dictionary and turns it into a dictionary we can give to Lob as an argument. The “main” function is where the majority of the logic for our script resides. Let’s cover that in more detail. Next we query Lob for the list of postcards that have already been sent. You’ll notice that the “processed_addrs” variable is a Python “set”, if you haven’t used a set in Python before, a set is sort of like an array that doesn’t allow duplicates. We only fetch 100 results from Lob at a time, and use a “while” loop to make sure that we get all of the results. Then we iterate through all of our results and add them to the “processed_addrs” set. Note the use of the “addr_identifier” function, which turns each address dictionary into a string that uniquely identifies that address. Next we set up a bunch of variables that will be used later on, variables with configuration information for the postcards that Lob will send, the addresses from the Kickstarter backers export file, and variables to keep track of who we’ve sent postcards to and who we still need to send postcards to. At this point, we’re ready to start validating addresses, the code below loops over every line in the Kickstarter backers export file and uses Lob to see if the address is valid. If the address is indeed valid, we check to see if we’ve already sent a postcard to that address. If so, the address is added to the list of addresses we’ve “already_sent” postcards to. Otherwise, it’s added to the list of address we still need “to_send” postcards to. Next we print out the number of backers we’ve already sent postcards to and check to see if we need to send postcards to anybody, exiting if we don’t need to send postcards to anybody. If the user enters “Y” or “y”, then we start sending postcards. The call to Lob is wrapped in a “try/except” block. We handle calls to the Lob library that return a “LobError” exception, counting those calls as a “failure”. Other exceptions are not handled and will result in the script exciting with that exception. Lastly, we print a message indicating how many messages were sent and how many failures we had. And there you have it, a short script that uses Lob to send postcards to your Kickstarter backers, with code to only send one postcard per address, that gracefully handles errors from Lob. I hope that you’ve found this useful! Please let us know of any issues you encounter on Github, or send pull requests adding exciting new features. Most importantly, enjoy easily bringing smiles to your backers! This entry was posted in Uncategorized on April 22, 2014 by Mike Rooney. Last year was my second year as a freelance programmer, and I’d like to continue my habit of retrospectives, so here’s another. My primary work philosophy has been to figure out how much I need to earn each month, and then work as part-time as possible to earn that amount. 2012 was a sort of proof-of-concept of that strategy, and demonstrated success in the various aspects of that: I was able to accurately predict how much money I’d need, I was able to land gigs to earn that money, and I greatly enjoyed all the extra free time I had as a result. 2012 (the left half) was erratic while in 2013 (the right half) I worked less, but more consistently. In 2012 I averaged about 13 hours per week, while last year I averaged about 8. What is most interesting is that I was able to reduce my weekly hours by 62% while only reducing my annual income by 12%. That’s because last year I was able to increase my effective hourly rate by about 53% compared to 2012. I didn’t change the hourly rate I advertise to clients, so how did I increase my effective hourly rate? Preferring project-based contracts to hourly contracts. These allow me to quote a fixed price, and the faster I get the project done, the more per hour I make. Having had good experience in 2012, I felt confident enough in my estimates to push for more project-based contracts in 2013, which have proven to be much more profitable. Recurring income. I’m now covering 26% of my monthly budget with recurring payments for hosting and support, whereas I ended 2012 at around 15%. I’ve previously spent some time making sure my hosting and deployment is unified and simple, so while I almost doubled my recurring income year over year, I certainly didn’t have to double the amount of work I have to do each month to keep all the sites up and running well. For 2014, I expect I’ll continue working around 8 hours per week, and focus on building Django apps from scratch, which are my favorite projects and lead to recurring revenue. I’ll also continue working on personal incubation projects like BatchedInbox; I’d love to be partially supporting myself with those. Definitely let me know what your contracting or salaried experience has taught you, and if you’ve got any questions or suggestions! This entry was posted in Uncategorized on January 6, 2014 by Mike Rooney. I recently completed a website for an organization, and they wanted two more with very similar functionality but different branding. I thought it might make sense to fork the initial repository and maintain and host them as different sites, but this duplicated all the code and required more memory (about 100MB each) and maintenance. I also considered refactoring the common functionality out into a reusable app, but this would require a fair amount of work, and still require more memory and operations maintenance. I came across some good solutions, but they involve having separate settings files for each project and having a set of gunicorn processes for each. If that’s what you want, those solutions would be great. In my case, I just wanted to create a few django sub-applications and have different domains go to the appropriate URLs. Here’s the approach I took. 1. Create a sub-application for each branded version. This is as simple as running “manage.py startapp”, and creating the URLs, views, models, and such that you want for each app. For templates, I created a base template for each application that override appropriate branding blocks from a project-wide template. Each individual application template then extended its own branded base template. 2. Include the application URLs in your root URL conf. Now, I could visit example.com/, example.com/foo/, and example.com/bar/ and see the appropriate branded versions with their own templates, views, and models. Almost there. 3. Handle the root URL and error pages for each app. These two functions simply look up the correct view / template to render based on request.get_host(), falling back on the root project. My handler404 looks a little different because I’m using Jinja2, but you can get the idea. You could also implement handlers for other errors as you need. If you’ve got different domains that you want to be hosted by the same codebase, database, and workers, this approach is straightforward and only requires a few lines of special code. On the other hand, if each application needs its own settings.py, database, or differs significantly in functionality, it makes sense to run multiple gunicorn masters pointing at different settings files, or even to create separate projects sharing a reusable app. This entry was posted in Uncategorized on August 13, 2013 by Mike Rooney. I’ve been carefully tracking my personal finances for the past 8 years or so (using my own software, wxBanker), and thought it would be a fun exercise to analyze the graph of my savings or “net worth” over this entire period. Each period was surprisingly different! 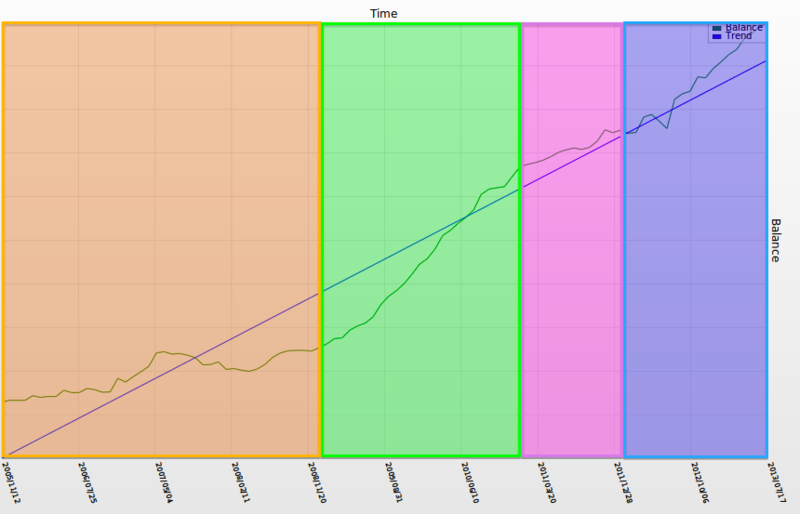 The green line is my actual total savings, while the blue line is just a 2nd degree best-fit line that you can ignore. Take a look at how the slope noticeably changes for each period! Let’s look at each of the segments. This was a very frugal part of my life. I was very fortunate not to have much tuition obligation due to financial aid, a large academic scholarship, and a generous family. So what you see here is me scraping savings together, not always outpacing the cost of rent, books, and food. The two humps were paid internships which RIT called “co-ops”. After college I took an offer at a startup in California (Genius.com). The graph here is oddly linear, despite a couple raises. Perhaps I just spent the extra money on more frozen yogurt. After 2 years at this job, I along with the majority of the engineering team was laid off. The change was welcome, and I used the severance to interview full-time. 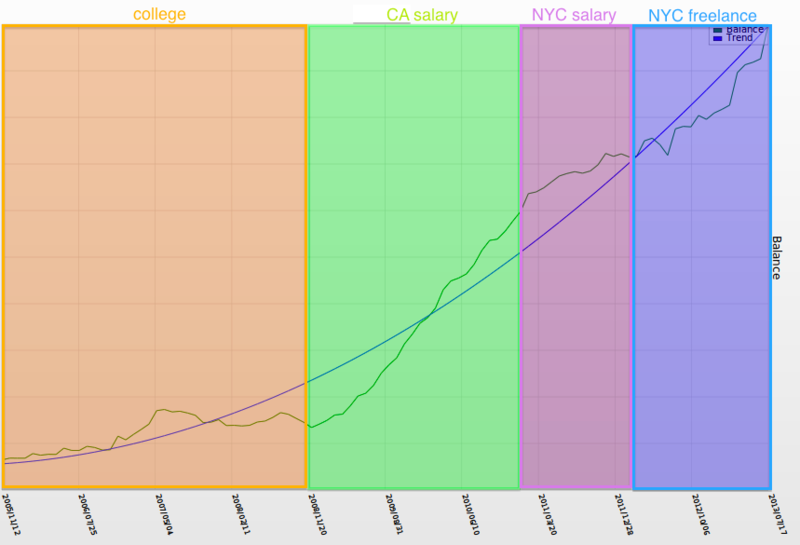 I found a much smaller “pre-A” start-up, Canvas Networks, and took the job, which required a move to NYC. The growth of savings here makes a steep change for the worse. Taking a decent pay cut (the understandable cost of working at 4 person company where I could get >1% equity), plus moving to the most expensive city in the country are the main causes. There’s a lot more volatility as well, likely from things such as broker’s fees and having to pay overlapping rent on two apartments for a month while I moved. While I did end up getting raises that eventually brought me well beyond my previous salary at Genius, they were put entirely towards moving out of a windowless sublet into my own nice, sunny apartment. After a year at Canv.as I decided the full-time life wasn’t for me, and quit to become a part-time freelancer. Here is where things get really interesting: I went from working about 50 hours a week to working no more than 10 hours per week, and I started saving more. After I started freelancing and had the choice to work as much or little as I wanted, I decided I’d prefer to work the “lowest responsible amount”. In other words, figure out my full budget including rent, food, health care, still saving money, etc, and just work enough to earn that much (after taxes). Freelancing 10 hours a week ended up being a 40% pay cut, but it was a great trade for an 80%+ hours cut. But why am I saving more now? First, my expenses were dramatically reduced because my girlfriend and I moved in together, halving my rent and utilities. This alone is about $1,200/mo, $14,400/year, which used to require an extra $20K in earnings to support after losing a third of it to taxes. Having enough time to cook, which I love, also saved me from buying breakfast and dinner multiple times a week. This was easily costing me an extra $100/week, ~5K/year, again requiring about $7.5K in salary to support due to taxes. Doing business as an S Corporation also meant a lot of my normal expenses became tax-deductible (a home office deduction was huge), and my effective tax rate itself was also lowered due to being able to (perfectly legally) take much of my profits from the company as a distribution instead of personal pay, avoiding some taxes on that portion of income. For me, working part-time also meant less burn-out, meaning fewer expenses related to entertainment, drinks, and vacations required to “decompress”, etc. Finally, since about 80% of my money is in stocks / mutual funds, the recent market rally also helped a lot. For what is worth, bank interest currently accounts for 2% of my total savings, and capital gains/losses for 18%. Wow, you read it all, maybe! Do you do any kind of analytics, budgeting, or financial retrospectives, or am I the only one? This entry was posted in Uncategorized on July 17, 2013 by Mike Rooney. Freshbooks recently released a name-your-own-price ebook titled “Breaking the Time Barrier“. It is a pretty quick ~1 hour read about how to price your freelance / contract services and make more money with more and better clients. I figured I’d write a quick review for my own purposes as well as for anyone who might come across this. The basic premise is that pricing your product / service based on the amount of hours you contribute is not ideal for you or your client, and that ideally you should get away from ever quoting hourly rates or basing your price directly on your hours. The alternative to the hourly pricing model suggested is to price based on the value you are providing to your client. Upon first reading this, my initial thought was that it just sounds like they are suggesting that you charge clients as much as their budget allows, which isn’t really in line with my values. The second problem that follows this is that if you are charging more than your typical hourly rate, why wouldn’t they just choose someone else who comes in with a cheaper quote? The answer to both of these is that you can provide a dramatically more valuable service by understanding the value they hope to get out of your work. For example, a typical web client might say that they need a web page created with specified buttons at specific spots and of specific colors. You can figure out how long that will take, which might be for example $1,000 worth of work, and if your quote is competitive and they like your background, you’ll perhaps land the gig. On the other hand, if you ask what value they are hoping to obtain instead of blindly following directions, they might say that their current home page is only converting at 1% and they’d like to increase that. With the understanding that the client wants to increase currently low conversions, you can now provide more value by providing your expertise, perhaps explaining why they are currently seeing low conversions and how you think you can improve upon their current design even more. So now you can come in with, say, a $5,000 or $10,000 quote where you suggest doing the page differently because you believe it will increase conversions significantly more than what they proposed, ideally with some data and previous numbers to back it up. Imagine you are the client, and you’ve got a quote or two coming in at around $1,000 to blindly do exactly what you asked, and another one coming in much higher, but from someone who actually understands your goals and has proposed a way to add significantly more value. I can definitely see how those $1,000 quotes aren’t attractive after seeing that you could leap-frog what you originally wanted. I’ve seen these principals work their way into my own projects, as I realized that I shouldn’t just be doing everything exactly as clients ask, if I think something else would serve them better. Now I’m not afraid to say “Hey, you asked for X, but if your goal is so-and-so, do you think you might be better served by Y instead, because of A, B, and C?” Often times the answer is “Yes, that’s a great idea!”, and my experience agrees with the book that clients are generally quite happy to pay significantly more money, even if they’ve got a much lower quote from someone else, when they believe you are going to add a lot more value than someone else. The book goes into a lot more specific details about handling conversations, pricing, and timing, so if this is interesting, give it a read. In short, I definitely agree with the premise that you shouldn’t be afraid to charge what you are worth to the client if you can position yourself as being able to add significant value, and that the best way to do this is to ask questions so that you understand why they are seeking this work in the first place. This entry was posted in Uncategorized on June 27, 2013 by Mike Rooney. reduces anxiety — you won’t feel the need to check your inbox constantly! 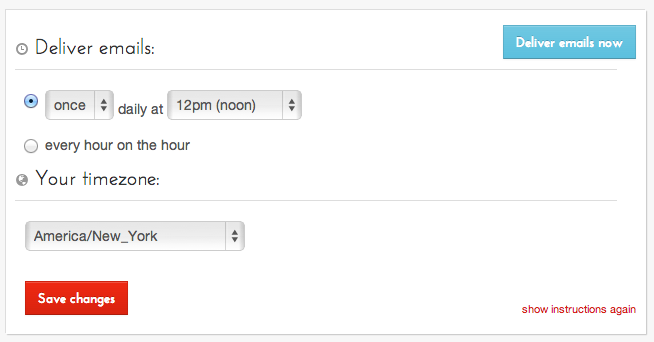 Before creating BatchedInbox, I tried batching “manually” by only checking email at specific times. This didn’t work well; I’d still get distracted by new emails when searching for an existing email, composing a new one, or using GChat. I’d also just obsessively and unconsciously check the tab as a way to procrastinate on the task at hand. I and a handful of beta testers have been using it successfully for a bit, so I feel comfortable announcing it and having others use it. If it interests you, please check it or the FAQ out, and I’d love your feedback either way. It is intended as a permanently free service, supported by myself and perhaps your generous self via Gittip. This entry was posted in Uncategorized on April 2, 2013 by Mike Rooney.